Founded in 1990, the Case Management Society of America (CMSA) has grown to be the leading non-profit association dedicated to the support and development of the profession of case management. It is based in Little Rock, AR, and serves a community of more than 35,000 members and participants as well as 75 chapters through educational forums, networking opportunities, legislative advocacy and establishing standards to advance the profession. Its leadership programs, educational forums, and breadth of tools and resources enable case management professionals to ensure more positive outcomes for individual patients’ healthcare needs. Case management professionals help patients get healthier, faster; and help curtail the exorbitant costs that too often afflict the nation’s health care system. To further the professional knowledge and career opportunities of its members, CMSA also offers a number of education programs. 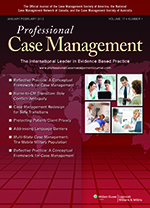 Professional Case Management is a peer-reviewed, contemporary journal that crosses all case management settings. The Journal features best practices, industry benchmarks, and hands-on information for both the professional case manager and those newer to the specialty. Additionally, PCM provides continuing education opportunities and cutting-edge research, as reflected in the tagline, Leading Evidence Based Practice Across Transitions of Care. NEW! Print Option for CMSA Members! As the Official Journal of CMSA all members receive complimentary online access to Professional Case Management as a benefit of membership. A print subscription to Professional Case Management is now available to all members for an additional $35.00 fee (per year) directly through the publisher. To add the print version to your subscription, please call the publisher’s Member Services at 1-866-489-0443 and reference promotion code MGK296ZZ.